In a shallow bowl, beat together egg whites, spices, and stevia. Mix together. Place eggplant slices in mixture and soak. Meanwhile, preheat waffle iron or pan. Make sure you grease it well! Place eggplant slices in your cooking vehicle or choice and cook until softened and golden brown. 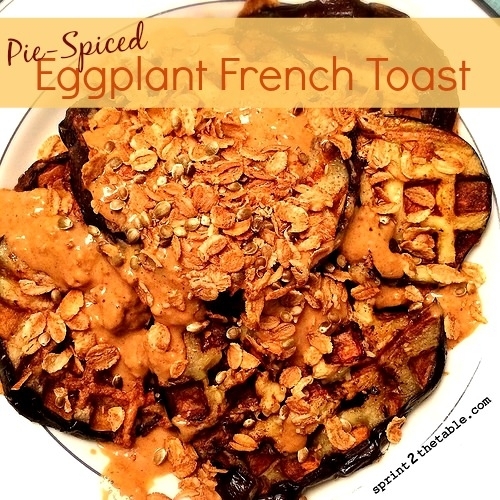 If youâ€™re using a waffle iron, push down on the lid to help flatten and cook the eggplant. Plate and top with protein syrup (optional; recipe below). In a small bowl, mix ingredients together. Pour over waffle. Eat.